South of Heraklion lies Crete's second most important Minoan archaeological site, the Palace complex of Phaistos, considered by many to be a finer example of Minoan architecture than Knossos. The west propylon, the monumental entranceway to the palace, is particularly impressive, and the ceremonial staircase and great court are breathtaking. Like Knossos the site has actually been built on twice, with the original palace, built about 2000 BC, having been destroyed by fire and replaced with a new palace around 300 years later. A number of valuable artefacts have been found on the site including the Phaistos disc which was discovered in 1908 in the basements of the northern complex of the palace. This artefact is a clay disk, dated to between 1950 BC and 1400 BC and impressed with a unique and sophisticated hieroglyphic script. A number of tombs were also found, a short distance from the ruins of the palace complex, and these are thought to belong to the one-time rulers of Phaistos. 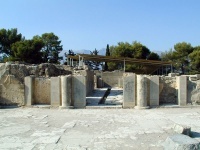 The city of Phaistos is associated with the mythical king of Crete, Rhadamanthys, and the city is mentioned in many old texts including Homer, who detailed the city's involvement in the siege of Troy. For anybody with an interest in archaeology Phaistos is a must.